Organized crime in America today is not the tough hoodlums familiar to moviegoers and TV watchers. It is more sophisticated, with many college graduates, gifted with organizational genius, all belonging to twenty-four tightly knit "families," who have corrupted legitimate business and infiltrated some of the highest levels of local, state, and federal government. Their power reaches into Congress, into the executive and judicial branches, police agencies, and labor unions, and into such business enterprises as real estate, retail stores, restaurants, hotels, linen-supply houses, and garbage-collection routes.How does organized crime operate? How dangerous is it? What are the implications for American society? How may we cope with it? In answering these questions, Cressey asserts that because organized crime provides illicit goods and services demanded by legitimate society, it has become part of legitimate society. This fascinating account reveals the parallels: the growth of specialization, "big-business practices" (pooling of capital and reinvestment of profits; fringe benefits like bail money), and government practices (negotiated settlements and peace treaties, defined territories, fair-trade agreements).For too long we have, as a society, concerned ourselves only with superficial questions about organized crime. "Theft of the Nation" focuses on to a more profound and searching level. Of course, organized crime exists. Cressey not only establishes this fact, but proceeds to explore it rigorously and with penetration. 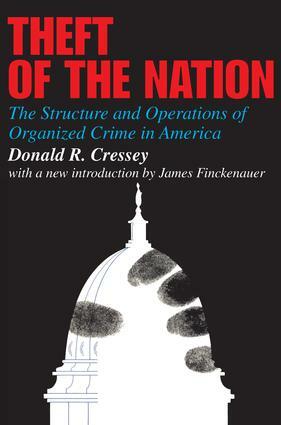 One need not agree with everything Cressey writes to conclude that no one, after the publication of "Theft of the Nation", can be knowledgeable about organized crime without having read this book.